The elegant Capped Faux Pearl Rosary is the perfect piece for daily prayer and religious contemplation. 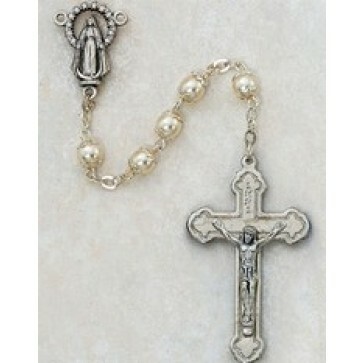 The beautifully crafted rosary features delicate glass beads that have the look of real pearls. The budded end crucifix is adorned with an Immaculate Conception center piece that adds even more beauty and prestige to the already impressive design. The silver-tone rosary is priced affordably and makes the perfect gift for a wedding, a first communion or a baptism.